When we, as anarchists or anti-fascists, go out into the streets, questions should arise: What are we doing here? What are our goals? What is the most appropriate or powerful way to achieve those goals? Our tactical choices should always be in service of our goals — they should never be goals in themselves. When we, as anarchists or anti-fascists, go out into the streets, questions should arise: What are we doing here? What are our goals? What is the most appropriate or powerful way to achieve those goals? Our tactical choices should always be in service of our goals — they should never be goals in themselves. I fear that in the anti-fascist movement, the tactic of black bloc has become fetishized and that this fetishization has impeded the growth of our movement and struggle. That isn’t at all to say that black bloc doesn’t have a role, but it seems to be imperative that we reflect on our goals as a movement and constantly assess whether or not our tactical choices are moving us toward those goals or not. Does holding onto black bloc as an identity help or hurt us as a movement? The position I hold, along with many of my First of May comrades, is that the goal of anti-fascist struggle is to organize and promote a united working class defense against the violence and proliferation of fascist attacks and ideology. This means our goal must be to attract the working class, with the entirety of its racial, gender, ethnic, and religious diversity included, to participate alongside us in a mass movement against fascism in the public sphere. As anarchists, our own goals go further in that we hope that such a mass movement could take on a revolutionary character against all power structures that oppress, over and beyond specific concerns of fascism. The fact that we, as anarchists, strongly believe in democracy and community self determination should also be recognized when considering our role in the streets. Clearly, if we are for a united working class defense and a truly democratic revolution and society, some of our movement’s biggest concerns should be the potential alienation of people we want to draw to our movement and our potentially self-imposed (though perhaps not conscious) role as a vanguard or political elite presence. Unfortunately, often the presence of black bloc, particularly at mass public events (or while filling potholes), achieves exactly what we want to avoid. While it is important to be militant, it is equally as important, for our goals, to be approachable and relatable. The contrast between showing up as a regular person whose stake in this resistance is just as legitimate as anyone else’s, no more and no less, and showing up as some antifa superhero whose costume portrays a particular claim on the movement is stark and could make all the difference in terms of how many people we attract and who we attract. If this is a public movement, and I believe it must be as per our goals, we need to be public people. Just like we are in our everyday life. Additionally, failure in addressing this makes claims of “outside agitation” all the more believable — if we don’t look like part of the community, how can anyone think otherwise? Although the narrative of “outside agitation” may not be fair, popular narratives are something we must strategically contend with. Furthermore, we need to understand that although black bloc has a rich and inspiring history, whether rightly or wrongly its history can also hold connotations of whiteness to many communities of color who don’t have publicly well known history of participating in it. As someone who comes out of the Muslim community, I can tell you right now that this had been my initial impression — black bloc: that’s what those adventurous white boys do. It wasn’t just the aesthetic that somewhat took the seriousness out of it, but it was also the perceived lack of participation of people of color. I, being someone who was not well versed in the history of the tactic, understood black bloc through what the pop-cultural narrative provided me, and we cannot assume that this isn’t the case for many people that we hope to appeal to as anarchists or anti-fascists. Moreover, it certainly does not help that many people’s personal encounters with black bloc has indeed been an encounter with something mainly white and often adventurous. We should not assume or expect that people will have context for black bloc. The actions around the 4th precinct in Minneapolis in 2015 illustrated this point — as soon after a masked white supremacist shot at Black Lives Matters protesters, well-intentioned anarchists had arrived masked up. This caused confusion among the community and thus required unnecessary intervention. The problem is that the whole thing is either alien to a lot of people or brings up negative connotations. These problems can be addressed by cultivating relationships, having community ties, and having people see the use of black bloc when it makes sense over time. That means engagement — and engagement requires some degree of approachability from the start. As mentioned earlier, there is something vanguardist about having a uniform group of unapproachable people often trying to impose a direction (often mistaken for agitation) at a mass event. This is undemocratic and if we are take pre-figurative politics seriously, we must combat this tendency. A particularly egregious case of this behavior took place in Richardson, Texas recently at a mosque defense, where the antifa black bloc presence actively antagonized the very community they claimed to be standing alongside in defense. In the end, the Muslim organizers met with the very bigots who were targeting the mosque — one would speculate because both groups were so opposed to the antifa presence. Of course, the fact that those organizers were liberal has something to do with that meeting, and furthermore I am not saying that anarchists should subordinate themselves to liberal leadership and demands as a rule. However, when you’ve driven the very community under attack to meet with their attackers because that seems more appropriate than engaging with you, as an anti-fascist, then something obviously went horribly wrong. An important point to make, I think, is that understanding the setting and context you are engaged in and recognizing all the language-games and particulars that go into that is what should determine the shape of your presence, and that there should be no adherence to general tactical rules in this regard. Feel the situation out, and focus on what one needs to do to achieve the goal of a united working class movement. If black bloc is alienating the Muslim community, then it is exactly the wrong tactic for that setting. There are some who may feel that I am saying to compromise on our politics or our militancy, but I absolutely do not feel that is the case. Alienating the people who may want to stand with us compromises our movement as a whole. Do we truly expect on-the-spot conversions to anarchism at mass demonstrations (and do we expect black bloc helps achieve that)? Or do we recognize that mutual political education is something that takes time, effort, and most of all, the development of real relations? How can these relations develop if we are unapproachable and antagonistic to the public from the start? If black bloc is to be effective in our historical context (which is far different from the context in which developed), it must function as part of the mass working class resistance movement and not as an isolated wing of adventurists. Lastly, I do not want to disregard the security concerns that lead many to mask up. I am certainly afraid of being followed or doxx’d by fascists or being recognized by the state. I do not take such concern lightly, but I believe there must be a balance, particularly in light of the goal of an open, public movement. I believe that public events are places in which our movement has an opportunity to grow, and it is important that we are approachable if possible. If one feels that there is possibility of danger or is going to engage in an action that requires anonymity (and many actions do), then it’s appropriate to carry a mask and use it when the situation deems it necessary. Everybody will judge a situation differently, and everybody has different security concerns, and all of that is fair. However, security should not be our only concern — we need to remember that we have a political purpose, and that although revolution is risky, it is necessary and we should make our decisions in light of that. 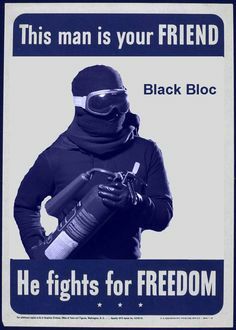 If black bloc is to be effective in our historical context (which is far different from the context in which developed), it must function as part of the mass working class resistance movement and not as an isolated wing of adventurists.